The Atlantic overturning—one of Earth's most important heat transport systems, pumping warm water northward and cold water southward—is weaker today than any time before in more than 1000 years. Sea surface temperature data analysis provides new evidence that this major ocean circulation has slowed down by roughly 15 percent since the middle of the 20th century, according to a study published in the highly renowned journal Nature by an international team of scientists. Human-made climate change is a prime suspect for these worrying observations. A specific pattern of regional ocean warming and cooling—practically like a fingerprint"
"We detected a specific pattern of ocean cooling south of Greenland and unusual warming off the US coast—which is highly characteristic for a slowdown of the Atlantic overturning, also called the Gulf Stream System," says lead-author Levke Caesar from the Potsdam Institute for Climate Impact Research (PIK). "It is practically like a fingerprint of a weakening of these ocean currents." As the currents slow down, they bring less heat toward the north, causing widespread cooling of the northern Atlantic—the only ocean region that has cooled in the face of global warming. 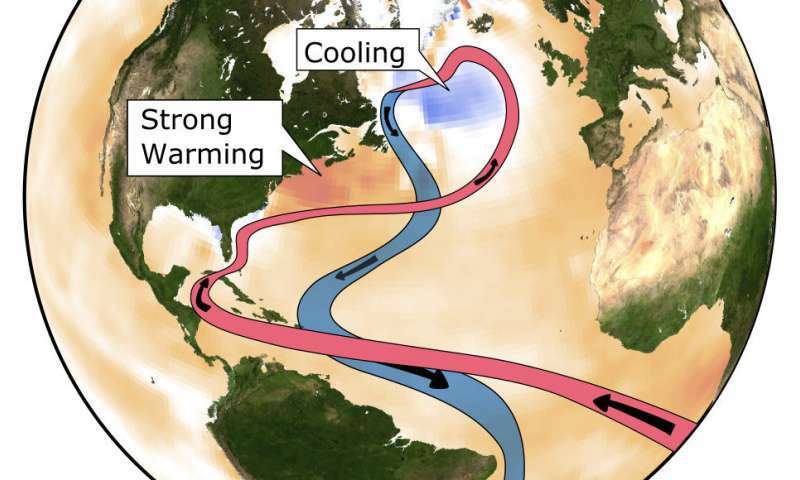 At the same time, the Gulf Stream shifts northward and closer to shore and warms the waters along the northern half of the US Atlantic coast. "That region has warmed faster than most other parts of the world ocean in recent decades," says co-author Vincent Saba from the National Oceanic and Atmospheric Administration (NOAA) Laboratory in Princeton. "This specific ocean temperature pattern has been projected by high-resolution computer simulations as a response to rising carbon dioxide levels in the atmosphere—now it has been confirmed by measurements." For decades, scientists have investigated the dynamics of the Atlantic overturning. Computer simulations generally predict that it will weaken in response to human-caused global warming. But whether this is already happening has so far been unclear, due to a lack of long-term direct current measurements. "The evidence we're now able to provide is the most robust to date," says Stefan Rahmstorf from the Potsdam Institute, who conceived the study. "We've analysed all the available sea surface temperature data sets, comprising data from the late 19th Century until the present." "The specific trend pattern we found in measurements looks exactly like what is predicted by computer simulations as a result of a slowdown in the Gulf Stream System, and I see no other plausible explanation for it," says Rahmstorf. It is in fact not just the pattern in space that matches between computer simulation and observations, but also the change with the seasons. The weakening is caused by a number of factors that can be linked to global warming which is caused by greenhouse gases from burning coal, oil, and gas. The Atlantic overturning is driven by the differences in the density of the ocean water: when the warm and hence lighter water travels from the South to the North, it becomes colder and thereby denser and heavier—making it sink to deeper ocean layers and flow back to the south. "But with global warming, increased rainfall as well as meltwater from the Arctic sea ice and Greenland ice sheet is diluting the waters of the northern Atlantic, reducing the salinity. Less saline water is less dense and hence less heavy—which makes it harder for the water to sink from the surface into the deep," explains Alexander Robinson of the University of Madrid, who co-authored the study. There have been long debates whether the Atlantic overturning could collapse, being a tipping element in the Earth system. The present study does not consider the future fate of this circulation, but rather analyses how it has changed over the past hundred years. Nevertheless, Robinson cautions: "If we do not rapidly stop global warming, we must expect a further long-term slowdown of the Atlantic overturning. We are only beginning to understand the consequences of this unprecedented process—but they might be disruptive." Several studies have shown, for example, that a slowdown of the Atlantic overturning exacerbates sea-level rise on the US coast for cities like New York and Boston. Others show that the associated change in Atlantic sea surface temperatures affects weather patterns over Europe, such as the track of storms coming off the Atlantic. Specifically, the European heat wave of summer 2015 has been linked to the record cold in the northern Atlantic in that year—this seemingly paradoxical effect occurs because a cold northern Atlantic promotes an air pressure pattern that funnels warm air from the south into Europe. The results are supported and put into a longer-term perspective by a second study by a team around David Thornalley from University College London, published in the same issue of Nature. This important analysis looks into Earth's past climate—using information that is for instance buried on the bottom of the ocean, in the composition of sediments—to reconstruct Atlantic overturning changes over the past 1,600 years. This so-called paleoclimatic proxy data provides independent confirmation for earlier conclusions that the recent weakness of the circulation is unprecedented at least for more than a millennium. The Atlantic overturning evolution over the past millennium deduced from indirect evidence of subsurface temperatures almost exactly matches that found previously by Rahmstorf and colleagues in 2015—which is quite remarkable, given that the new study is based on ocean sediments, while the earlier study used a network of evidence found on the land surface, such as ice core and tree ring data. "Several lines of evidence are coming together to a consistent picture now, all pointing at the same weakening since the 1950s,"says Rahmstorf: "The subpolar Atlantic cooling, the warming inshore of the Gulf Stream, Thornalley's proxy data for subsurface Atlantic temperatures, and earlier proxy data from deep sea corals showing water mass changes in the Gulf of Maine." The Thornalley study also suggests that a part of the Atlantic overturning—the deep flow of Labrador Sea Water—was affected 150 years ago by warming and ice melt at the end of the 'Little Ice Age'. This illustrates the sensitivity of the overturning circulation to warming and freshwater input—something that is happening again now with human-caused warming and accelerating Greenland melt. However, judging by the data of past subsurface temperatures, this event 150 years ago was not associated with such a profound overall reduction in the heat transport in the Atlantic ocean as the warming from fossil fuel greenhouse gases that has occurred mainly since 1950—a global warming that is larger than any time before in the history of human civilization.